It certainly has over the past few days we’ve been busy liaising with a local company called L-Interiors which is doing a lovely little bit of CSR. 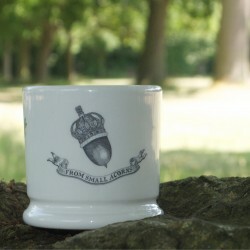 As speculation mounts in Bucklebury regarding the imminent birth of Prince William and the Duchess of Cambridge’s first child, the only shop in the village, L Interiors, has commissioned a unique keepsake – the limited edition ‘From Small Acorns’ mug – to mark the occasion. And, as a special celebration, to mark the occasion L Interiors will be making a donation from every sale of the mug to West Berkshire Mencap. Designed by a British company, Doris and Co, the stylish piece of home-ware is set to be a treasured souvenir of a unique moment in time. 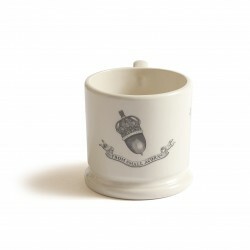 A simple design, created in classic cream-ware bears the inscription ‘From Small Acorns’, making it perfect not only as a celebration of the birth of the heir to the throne, but a cleverly stylish gift for anyone expecting their own little ‘arrival’ or indeed new venture! With its simple depiction of a crown and acorn in charcoal, the design was created in collaboration with Lynda Tillotson, the owner of L Interiors. 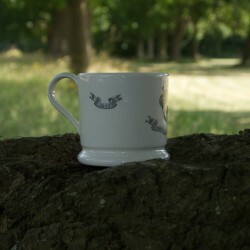 The mug is available from the shop in Bucklebury Village or on-line at www.llifestyle.com for £19.95* with a donation of £1.00 being made to local charity West Berks Mencap from the sale of every ‘From Small Acorns’ mug. Leila Ferguson, CEO of West Berks Mencap added: “Lynda at L Interiors has been supporting us throughout 2013, so we were particularly delighted when she said she would make a donation from the sale of every ‘From Small Acorns’ mug to help with our fundraising. It’s a beautiful piece and would make a lovely gift, whether to celebrate the Royal Baby’s birth or another special occasion, and you’ll be making a donation to a much-needed local charity too! We hope that this special gift sells out! West Berks Mencap works with people with learning disabilities throughout West Berkshire, as such this is a particularly lovely way to celebrate the birth of the Royal Baby”.